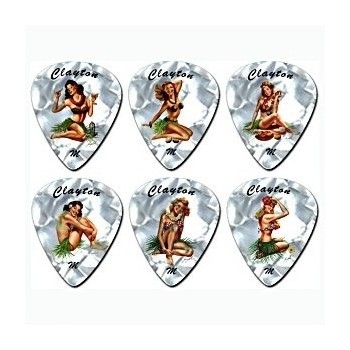 Clayton USA picks are well designed quality picks with great artwork. We sell the series Hula Hotties, American Hotties, Crazed Clowns, Snakes 'n Daggers, Rock Chicks and picks from the Blockbuster movie A Nightmare on Elmstreet. The picks are well designed and come in nylon, delrin of acetol material. Real American classics for a sharp price! On sale from € 12,95 for € 9,95! Clayton Crazed Clowns picks. These clowns are crazy and cool. Size: thin. Material: white nylon. Shape: teardrop. Order now 12 pieces of these crazy American clowns! On sale from € 12,95 for € 9,95. 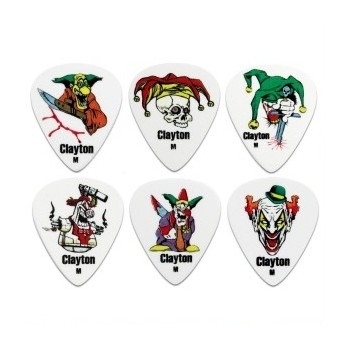 Clayton Crazed Clowns picks. These clowns are crazy and cool. Size: medium. Material: white nylon. Shape: teardrop. Order now 12 pieces of these crazy American clowns! On sale from € 12,95 for € 9,95. Clayton Crazed Clowns picks. These clowns are crazy and cool. Size: heavy. Material: white nylon. Shape: teardrop. Order now 12 pieces of these crazy American clowns! On sale from € 12,95 for € 9,95. Clayton Hula Hotties picks. These hot chicks are from Hawai. Size: thin. Material: pearl nylon. Shape: teardrop. Order now 12 of these Hawaiian hotties! On sale form € 12,95 for € 9,95. Clayton Hula Hotties picks. These hot chicks are from Hawai. Size: medium. Material: pearl nylon. Shape: teardrop. Order now 12 of these Hawaiian hotties! On sale form € 12,95 for € 9,95. Clayton Hula Hotties picks. These hot chicks are from Hawai. Size: heavy. Material: pearl nylon. Shape: teardrop. Order now 12 of these Hawaiian hotties! On sale form € 12,95 for € 9,95. Clayton American Hotties picks. These American hot chicks support the troops! Size: thin. Material: pearl nylon. Shape: teardrop. Order now 12 pieces of these American hotties! On sale from € 12,95 for € 9,95. Clayton American Hotties picks. These American hot chicks support the troops! Size: medium. Material: pearl nylon. Shape: teardrop. Order 12 pieces of these American hotties! On sale from € 12,95 for € 9,95. Clayton American Hotties picks. These American hot chicks support the troops! Size: heavy. Material: pearl nylon. Shape: teardrop. Order now 12 pieces of these American hotties! On sale from € 12,95 for € 9,95. 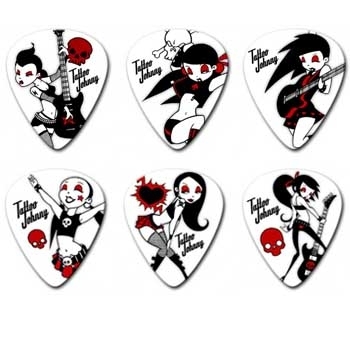 Clayton Rock Chicks picks are designed by tattoo artist Tattoo Johnny. These chicks rock! Size: medium. Material: white delrin. Shape: teardrop. Order 12 pieces Rock Chicks for € 9,95! Nightmare on Elmstreet picks are directly from the American filmstudios in Hollywood. Every horrorfan digs Freddy Kruger! Size: medium. Material: white gauged. Shape: teardrop. Order 6 times Freddy! 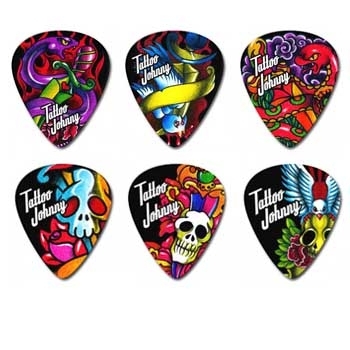 Clayton Snakes n Daggers picks have a great color full design made by Tattoo Johnny. Skulls en blood, but also a pigeon. Size: medium. Material: black acetal. Shape: teardrop. 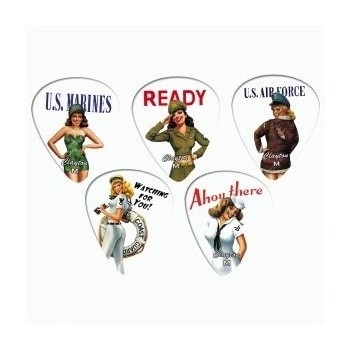 Order 12 pieces of these premium USA picks from € 12,95 for € 9,95! 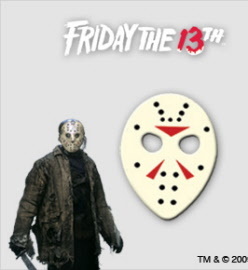 De plectrumset van Friday the 13th hebben zes medium plectrums die exact hetzelfde zijn als het masker van de horrorheld Jason uit de film. Ideaal als kado! Ook geschikt om gitaar mee te spelen. Nu een set van zes stuks voor 10,95 euro!